Today I attempted my very first SOTA activation, G/SE-005 Botley Hill. I dropped my fiancée off nearby to go wedding dress shopping with her friends. Needing to make myself scarce for a couple of hours provided what I thought would be the perfect opportunity to head over to Botley Hill and test out my kit on an easy summit before heading out anywhere more adventurous. I parked at the local pub after discovering that the Titsey Hill car park was temporarily closed for forestry works, then headed for the South Downs Way. The shopping trip was shorter than expected. I had screwed up my timing. 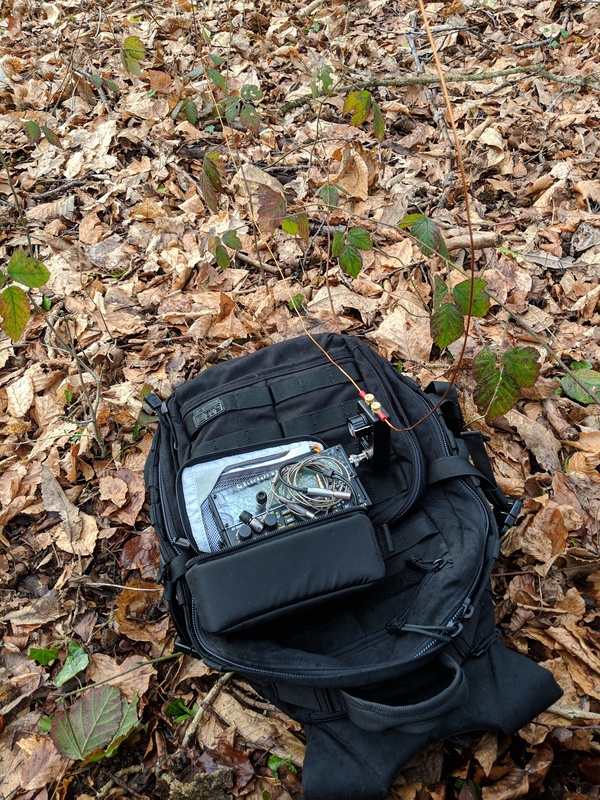 I packed up my HF gear and fired up my handheld in the hope of making some 2m FM contacts while walking back to the car. Sadly the gods of the airwaves were not feeling kind and I got back on the road without making a single contact. Oh well… I’m discouraged and will be sure to try again in the coming weeks. Never mind - there’s always another - better day to activate it. You should have pretended you had an audio problem in the call and couldn’t understand and replied with “OK so you don’t need me for 4 hours now.” Keep repeating that to whatever she said and then say “you’re breaking up… hello… hello…”. Then turn the phone off and enjoy the activation. Keep making out the phone has problems whenever you need a bit of “me time”. You should be able to drag this out for years. So that’s the secret to a successful marriage! Where abouts did you (attempt to) activate from? It’s quite a large activation zone up there. Yes, it covers quite an area. I’m pretty sure the beer garden of the pub is also in the zone! I started around grid ref TQ 40065 55551, then called CQ few times on 2M while walking back towards the car. My APRS beacon got picked up by a station 28 miles away on the other side of London, so I’m surprised I didn’t even manage to make any 2M contacts. You have run into the well known problem of the random activation that is unsuccessful. Did you post an alert well in advance of the activation? Did you contact known chasers in advance to ensure you would make contacts? Did you use a repeater to drum up some business on the simplex channel? Or announce a microphone test requesting listeners to give opinions on your mythical second microphone? Better luck next time, but generally I find you need to do something to improve the odds and depending on your location, the solution varies. We’ve all been there at some point and I know it’s frustrating but don’t give up. My recent failure was Wendover Woods G/CE-005. I went with both 20m SSB & a backup 2m FM handheld. 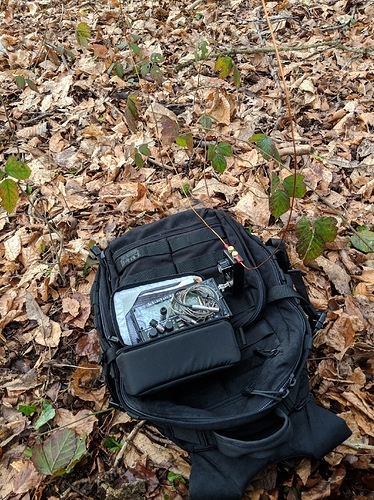 I got 3 contacts on 20m and tried for two hours on both 20m & 2m to get the last contact, even trying to gate crash a couple of nets and call into a special event station on 20m but failed miserably. They were all running significantly more power then me & I got drowned out in the pileup. I eventually got so cold that I had to give up!!! I did see your alert posted before hand and kept an eye out for a spot on the website but didn’t see anything and assumed that your plans had changed. I didn’t hear anything on 2m but a handheld from there to my location is extremely optimistic to say the least. A decent mast on 2m might just be possible under very favourable conditions (although it would still be a bit of a stretch). Try again & better luck next time! Ah yes, you were about 2km to the East of the actual summit there, but as you say, comfortably within the activation zone. It’s a bit of a VHF desert up there. I got one 2m FM QSO on my activation in 2017, then needed to deploy 20m CW to get the qualification. In 2018, it was all HF in the logbook. I called on 2m, but to no avail. Admittedly, on those two occasions, I too was only using a handheld and helical antenna. I have qualified in the past on 2m FM, but using an FT-817 and SOTAbeams portable antenna. Better luck next time when you have more time to spare - a more efficient HF antenna, would help you qualify the summit easily and quickly I reckon. Good luck in SOTA - you are entering a very addictive part of amateur radio if your genes are that way inclined. You will struggle to qualify any summits with a Wonder Loop. It’s useful as a receiving antenna but very inefficient as a transmitting antenna as G4OBK has suggested. Don’t give up, it is very frustrating when you make all the effort and fail. Took me three tries to qualify GM/ES-001 and that is a VERY long walk in! Thanks for the words of encouragement everyone. I’m still determined and will make a proper day out of it in the very near future! @M0GQC Wendover woods is also on my list. I live in North London, so it’s a close one. Sorry to hear about your failed attempt. @G4OBK @G3CWI The wonder loop is a bit of a compromise. It’s impressive for its size though. I use it mainly while running foundation practical assesments. I also have a sotabeams end-fed, which I suspect will be a lot more effective. I’m still learning morse, but once I’m confident with that I hope I can make the most of a compromise setup. Also failed my first activation with just 3 QSO’s (Didn't manage to activate G/NP-006 - advice needed) and not enough patience - but have managed on every one since. Main Changes (1) :- Spotting (!) - Via SMS if no 4G - Although some say its cheating I usually struggle for time for an activation so don’t usually spend more than an hour on the summit. 2 - More power - now have added a linear (HF) (40w), speech processor and LiPo cells and (3) as the sun has gone to sleep have added 80m to the dipole and recently …have not failed. Still working on the CW, have chased a couple of times and may pluck up courage to take a key up the hill… hardest bit … finding time to activate! Wendover woods is also on my list. I live in North London, so it’s a close one. Sorry to hear about your failed attempt. The true summit is in the woods a couple of hundred yards or so from the (paid) car park. This (as it’s name would suggest) has fairly think tree cover and is not the best take off for radio. Part of my failure was choosing to operate from the true summit in the wooded section. I’m a bit of a purist and wanted to operate from the true summit. I think most people prefer to operate from the trig point in a field down the road a little from the true summit (but still well within the activation zone) which is open and has a much better take off. I would suggest this is the better location. Several people have posted comments & advice on the summit page on this site, so all of the information is there. It sounds like you are at a similar stage to me with this. Hope to catch you on the air using CW at some point! I support your intentions to activate on CW once you feel more confident. As many others will confirm, most newcomers to CW activations are not entirely confident when they first try CW on a summit, and indeed it may well take a dozen activations to start feeling more comfortable. But all confirm it is worth it and now some former non-CW ops are going for awards for all-CW activations, or activations where at least 4 CW contacts were made. So even that is addictive. In the meantime, it seems certainly true that having another mode to draw upon, especially in Europe, would assist you to get those 4 contacts. More gain, better antenna on 2m FM is also helpful, and there are a number of antenna designs that can be run up a fibreglass pole to perform amazingly better than the little stubby antennas (aka radiating dummy loads). On the CW side again, chasing using CW is a good way to gain experience in copying it, initially on paper but eventually you recognise that most SOTA contacts follow a predictable pattern and you don’t need to do anything but log the contact as it happens. 73 and good luck on the next one. Thanks Andy! I’m gradually getting there with my CW copy. Sam, while having CW in your arsenal will certainly help you qualify a summit, it is only one aspect of activating. Planning is key and allowing ample time… as you have found out. My XYL is always kept informed as to how long I am likely to be when I am tying activations to other activities such as retail therapy, family walks, etc. Better still, try to keep activating separate. It is far more relaxing not worrying about time!